To Use Google Translate or Not? That Is the Question. Back to Basics | September 2016 Hearing Review. Reprinted with permission. Like many of my colleagues, I have a clinic in a large city where, in many cases, English is a minority language. Although, we learn how to give instructions and ask basic audiology questions in a number of languages, covering the entire range of dialog is not always feasible. Google Translate (and similar programs, such as Babylon) have therefore become a vital part of our clinical toolkit. An informal experiment was performed using Google Translate where 10 commonly used questions or statements were translated into 11 commonly presented languages in our clinic. 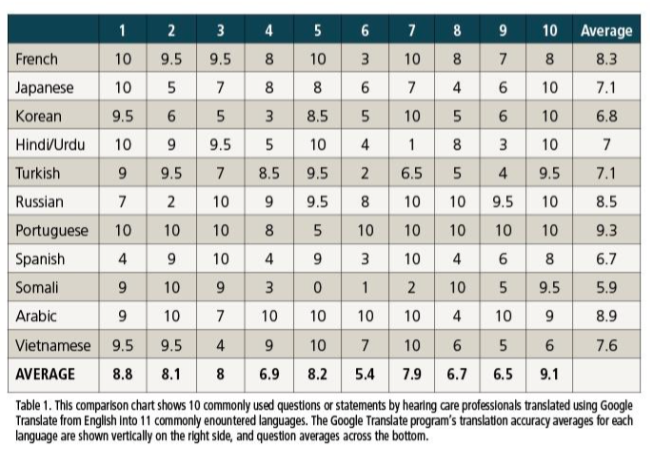 Based on the translations, subjective judgements by native English speakers were made of how close they were to the original meaning on a scale from 0 to 10. These are shown in Table 1 with averages vertically for each language on the right side, and question averages across the bottom. 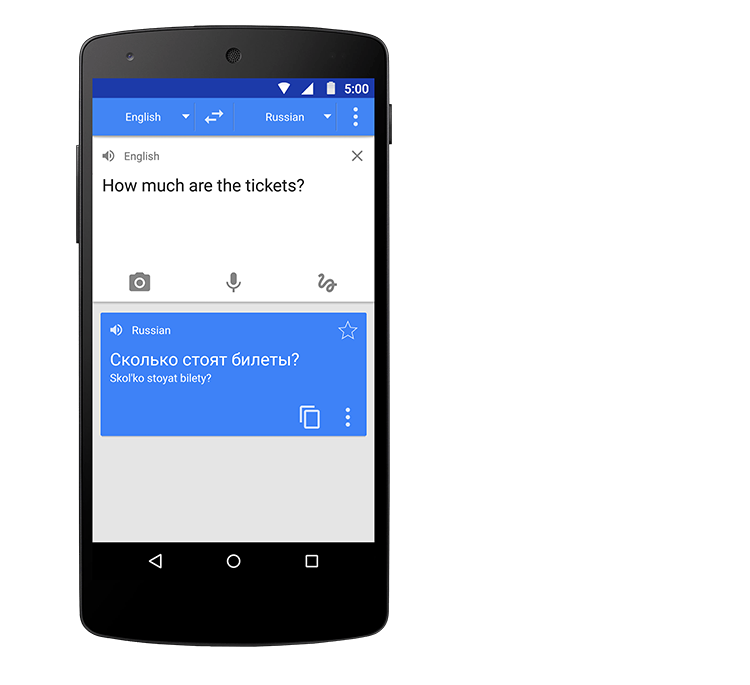 The comparison shows that, with Google Translate, certain languages fared poorer than others, as did certain questions. When was your last hearing test? Which is your better ear? Because your hearing is different in both ears, you should see an ear doctor. Hearing aids will improve the clarity of speech. Does your partner complain about you not being able to hear? Have you ever been dizzy? Based on your hearing results you would benefit from hearing aids. Let’s make an appointment for you to come back for further hearing tests. Questions 4, 6, 8, and 9 appeared to translate poorly on Google Translate with scores less than 7/10, and these are marked in italics in the above list. The most problematic of questions appears to be question 6, “Does your partner complain about you not being able to hear?” In contrast, question 10, “Your hearing is normal,” translated with the greatest accuracy (9.1/10). To complicate matters, there do not appear to be many rules of thumb that can help mitigate the issues. For example, two very similar languages, Portuguese and Spanish, which were only separated about 1000 years ago, have translation scores of 9.3/10 and 6.7/10, respectively, on Google Translate. One rule of thumb, however, is if a language has the same word order (ie, Subject-Verb-Object) as English, the translation appears to be more accurate (compare English with French, Portuguese, and Arabic)—all these have scores of 8 or higher. Languages with different word order (ie, Subject-Object-Verb) all appear to have lower scores when translated to English. Some examples of these translation error-prone languages are Japanese, Korean, Hindi/Urdu, and Somali. Google Translate or similar programs should be used with caution, and this is especially true if the syntactic word order is not the same as English. When a client can speak some English, ask them to say “Mary saw John” in their own language. If they say “Mary John saw” then this language does not have the English word order and programs such as Google Translate may provide erroneous results. However, if they translate that sentence into their own language as “Mary saw John” then the translation may have a greater probability of being correct. In cases where a language has different word order than English, and therefore, doesn’t score well for translation accuracy with the Google Translate program, it would be advisable to seek another method. Original citation for this article: Chasin M. Back to Basics: To Use Google Translate or Not? That Is the Question. Hearing Review. 2016;23(9):12.